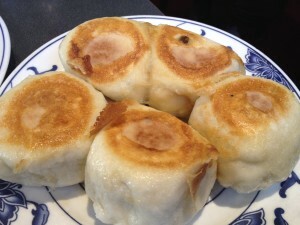 I have been trying to get to Chung Shin Yuan for dim sum for years. There are no little old ladies pushing food carts, but a menu of classic Taiwanese dim sum dishes. My friend Leslie and I shared 6 different items, some familiar and some new. 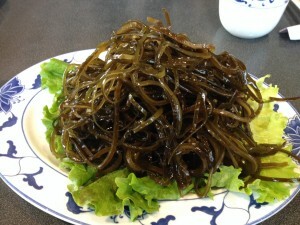 Seaweed salad – They used thicker, ropier kelp than in traditional Japanese seaweed salad, but I liked the refreshing, slightly acidic flavor. It was a nice counter to all the fried items we got. 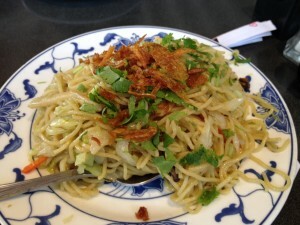 Taiwanese lo mein – the noodles were slightly overcooked, but I found the dish nostalgically comforting. I think it was Leslie’s least liked dish. It needed salt. 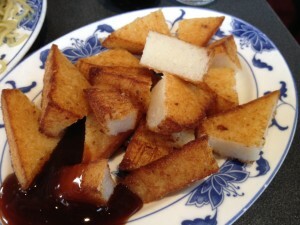 Fried turnip cakes – I loved these. Mama Tsoi’s version is usually studded with shreds of turnip and cubes of Chinese sausage. It is steamed and the pan fried. These were all smooth creamy turnip interior and a crispy exterior coating. 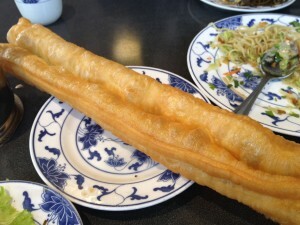 Chinese fried dough – This is a traditional accompaniment to congee, but they don’t offer that. Here, I saw everyone eating it with bowls of warm soy milk. They were excellent; shatteringly crispy and light. 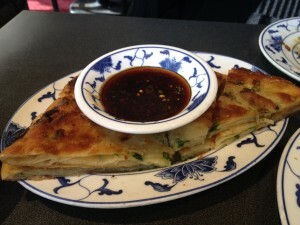 Scallion pancakes – They were a little heavy and greasy. 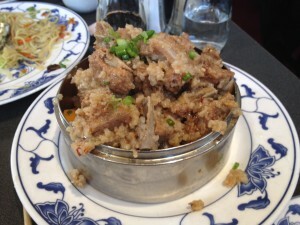 Pork spareribs – They were similar to the Chinese version, except they were steamed atop a layer of sweet potato chunks. That was just weird. This was Leslie’s favorite dish of the meal. Pan-fried pork buns – The exterior was doughy and the interior was a like giant, unseasoned pork meatball; my least favorite dish of the meal. Brunch begins at 11:30am, but the line starts queue up around 11:15am. The restaurant is small, so you want to get in to the first seating. The prices are inexpensive – we spent $40 for everything including tip. The service was efficient and the dishes came quickly, but spaced out correctly. It was fun to try something new, but I really missed my har gow (shrimp dumplings).